Boxer's Omen at 9pm - There is simply no other film that combines gore, horror, black magic, kung fu and mysticism in quite the same formula or quantity as Boxer's Omen. To avenge his brother's death, a boxer must become a monk and do battle with a witch doctor in a string of mindbending battles that you simply cannot believe until it penetrates your eyes. It's true, we will probably do some intermittent pop-up shows in the future, should we come across some films that absolutely HAVE to be seen, but this is the end of our regular run. We're honored that you stuck with us and yes, a little sad to go, but the memories have been great and we're happy about it all. So come on out, have fun and say GOOD RIDDANCE with us on April 20th! 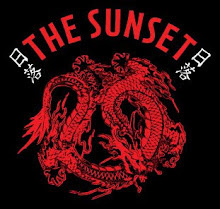 Sunset Tavern has been our home for almost 10years! March 16th - The Cat! April 20th - See Ya Later! Last Show! Arcane Comics in Ballard has been helping keep KFG afloat for many years and for that we love 'em. 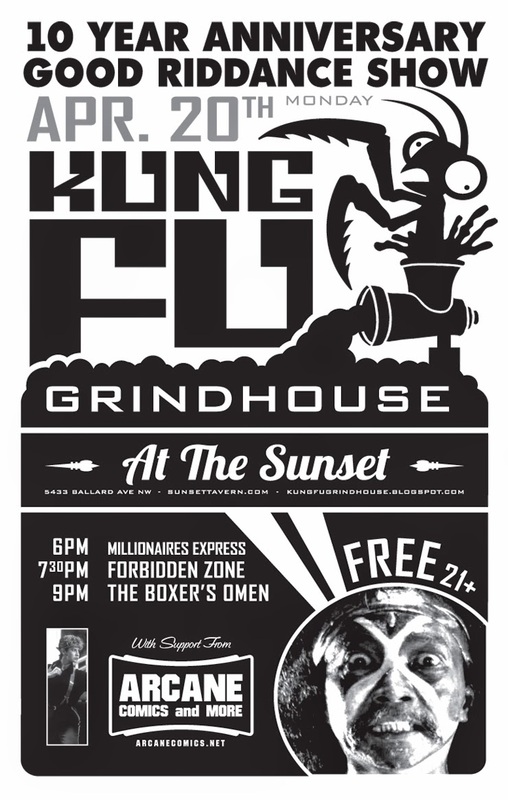 Kung Fu Grindhouse began as an effort to re-expose the badly decayed carcass of exploitation film history to a fresh audience of cinemaphiles. For nine years and counting we've tracked down the tastiest and trashiest forgotten and low-profile films and shown them to our friends in the hope that they will join us in preserving the memories of many a bygone movie era. The purpose of KFG is and always has been to encourage people to revisit and pursue these films on their own and to discover new ones for themselves. All the films we show are from our personal collection, and we never charge a cover. Usually the third Monday of every month at the Sunset Tavern in Ballard Washington. 6pm till done. All images are copyrighted by the individual artists, please don't use without explicit permission.